Thank you so much to everyone that took part in our challenge last week. I loved them all so I am so glad that the winner is picked at random. We all have ladies in our lives that we love. It could be your children, mother, friend or any of the amazing girls or ladies that are part of your life. This challenge is to make something for them. 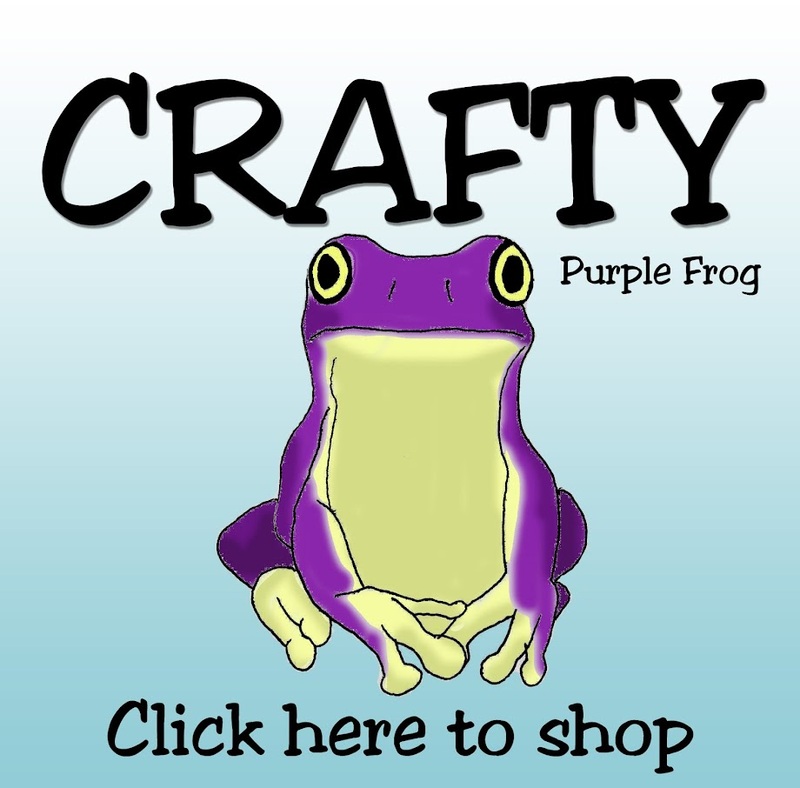 The prize for the random winner is a £10 voucher to spend in the Crafty Purple Frog store. 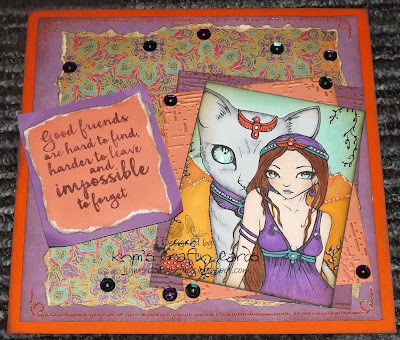 For my card I have used the following items First Edition Storyteller paper pad, Tim Holtz's Gathered Twigs distress ink, Crafter's Companion Textures Distress embossing folder, Dovecraft "Friends" stamped sentiment and some Dovecraft Bohemian sequins. 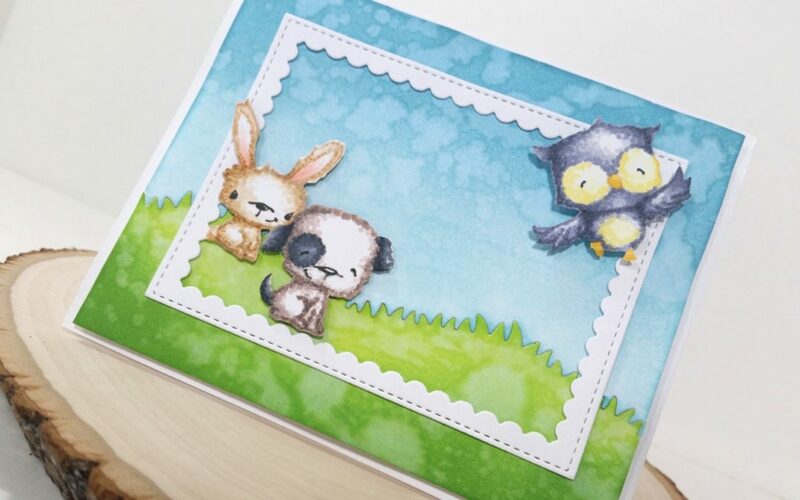 The gems, sentiment and papers for this card are from the neutrals goody bag, The card is C6 size, The cute lady is Loveable Anya from the greeting farm I have coloured her and done the dots around all the edges with spectrum noir illustrator pens. And it is all put together with collall glue and foam pads to make her stand out from the rest of the card. 'Rocker Chick' image by Kraftin' Kimmie, stamped using 'onyx black' Versafine. I used a 6x6 card blank and Little Angel Papers. 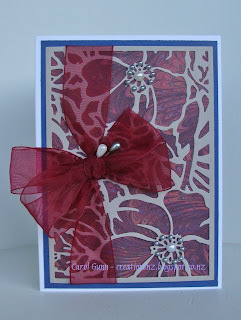 I heat embossed the sentiment using a Embossing Pad, Ebony Embossing Powder and a Heat Tool. Then added White Lace and a line of Dovecraft Gemstones as I do love to embellish! 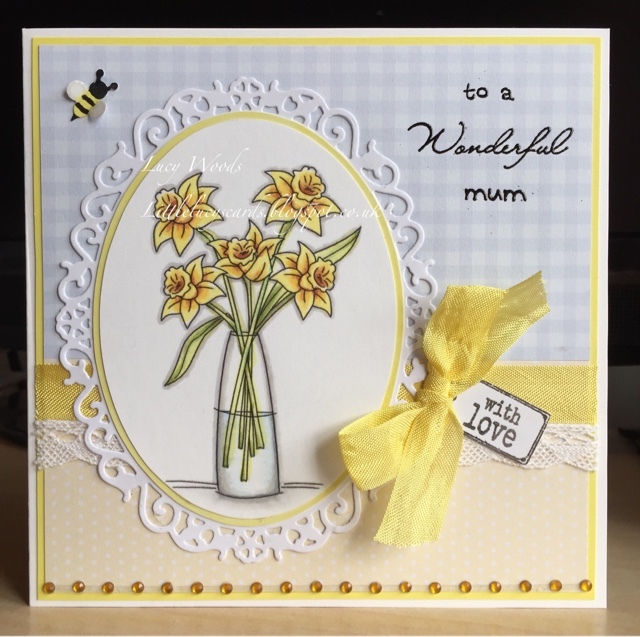 I have used a 6x6 card blank and papers from the Dovecraft Floral Muse 6x6 Paper Pack to create a Shabby Chic card. 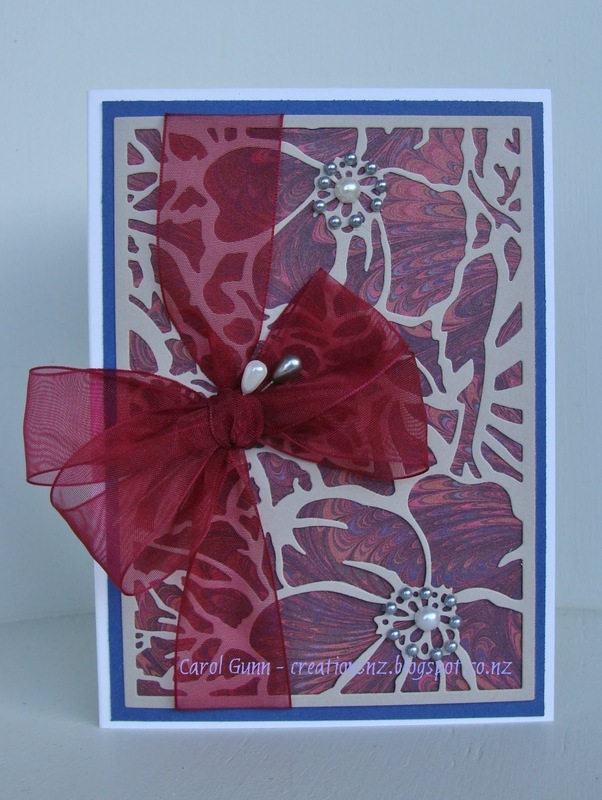 I added lots of Dovecraft Floral Muse Paper Flowers and cut two flourishes using the Butterfly Lullaby Die - Fancy Flourishes and heat embossed them using Versamark Ink and WOW Embossing Powder. I used Collall all purpose glue to put everything together. I created this card for either a Mothers day card for a new mum or a Nan or a first birthday card for a little girls first Birthday bit either way it is for that Special Person. 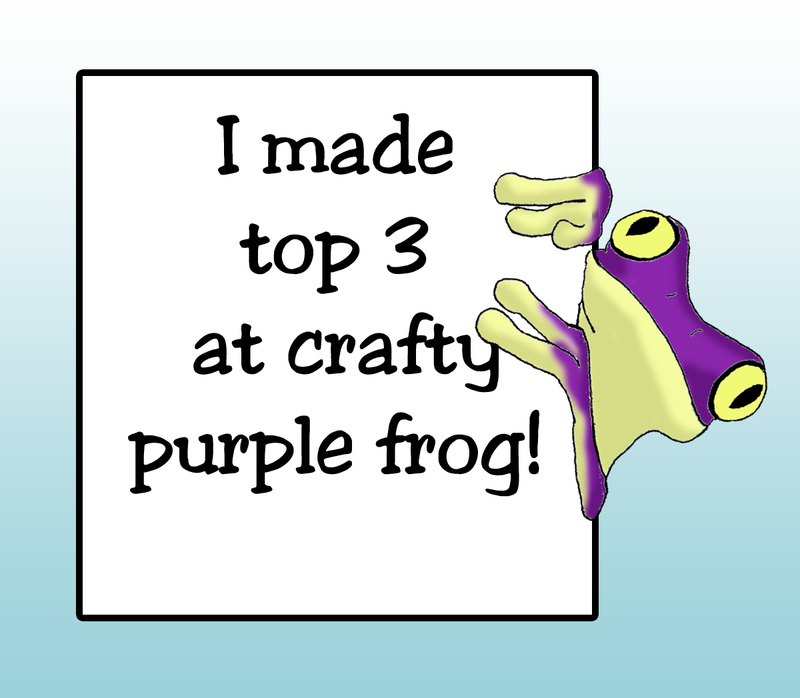 I created a pocket card by using two of the pink cards in the kit, there is everything in the kit to make some fab projects. 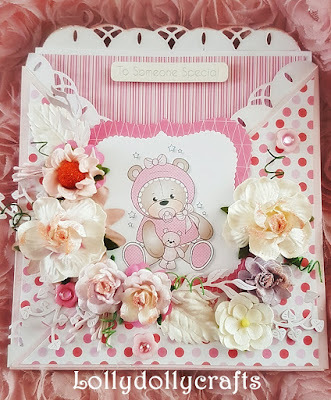 I added the pink buttons from the kit to the card front then in the centre of the buttons I placed some bling yes also in the kit there is so much in there. There flowers are from my stash but I added some WOW glittery embossing powder called Taffeta Pink to the flowers for that extra bling the photo does not do the glitter effect justice the WOW powders are so nice. 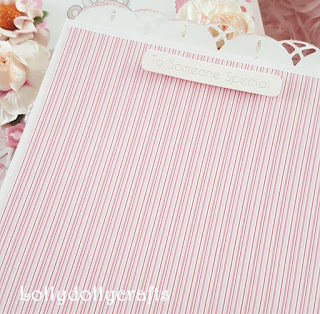 I also added the embossing powder to the edge of the pull out card centre.